Bushnell is a name associated with reliable and cost-effective outdoor products, and The Truth Laser Rangefinder is another quality addition to the Bushnell stable. This new rangefinder has a well-established lineage, with the previous model being given the thumbs up by legendary bowhunter Chuck Adams. The current model has been endorsed by Team Primos and boasts a range of enhancements that make it perfectly suited to multi-discipline hunters, offering simplicity, accuracy and reliability in a very user-friendly package. In the box, the rangefinder comes standard with a tether, a cordura pouch, a battery and a user manual. Like every bloke, I had a solid fidget with the rangefinder prior to opening the user manual, a good test of how intuitive the rangefinder is to use. With no prior instructions, I found it easy to bring up the menu system and program the rangefinder to suit my particular needs. The Truth rangefinder features Bushnell's ARC (Angle Range Compensation) system, and once programmed, will calculate the compensated range that you need to shoot for (see inset for further information on the ARC system). This particular rangefinder also features Bushnell's ClearShot technology and advises whether your shot is likely to be deflected by obstacles across the arrow's trajectory. When the buck of a lifetime steps out in front, it's features like this that give you the confidence to take the shot. 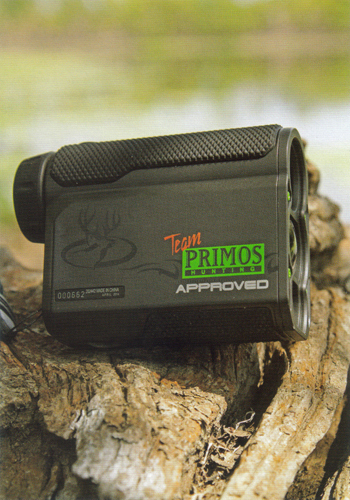 The Truth Team Primos rangefinder has a range of 850 yards (about 775 metres) on large reflective targets and is capable of detecting large animals such as deer, pigs and buffalo at 200 metres. In bow mode, The Truth will display angle-compensated range readings to 199 yards; beyond that the readings are line-of-sight only. It features 4x magnification with a 20 millimetre objective lens, a combination that provides an excellent field of view and rapid target acquisition that is lacking in higher magnifications, particularly at the shorter ranges that bowhunting takes place at. In the field, the rangefinder feels natural in the hand and, with its weight being a scant 170 grams, you will barely notice it until it's needed. Using the rangefinder is simplicity itself - pressing the top button brings the rangefinder to life and displays the reticle. Holding the button down or pressing the button a second time will shoot the laser and display the range. In bow mode, the rangefinder will display an angle-compensated range out to 199 yards, up to an angle of 90 degrees up or down, and line-of-sight readings beyond that to 850 yards. Target acquisition was very quick, well under the advertised 2 seconds, and far quicker than my personal high-end laser rangefinder.The display itself is clear and easy to read, if not a little'busy'while actually lasing. Once acquired, the range to target is clearly readable and remains displayed for several seconds. Of the several months of testing conducted the only downside found was use in very low light conditions, as the display was difficult to read. To be honest, it would be unlikely you could see your quarry clearly under such conditions so taking a shot with a bow would be unlikely. Bushnell's ARC System Many Bushnell rangefinders feature angle range compensation (or ARC) that compensates for the trajectory of your arrow (or bullet, with other Bushnell rangefinders) relative to the angle of the shot being taken. The trajectory of your arrow is its vertical curvature in flight as gravity exerts its influence, so the longer the horizontal distance being shot, the longer the time that gravity can pull your arrow down. Shooting at angles up and down shortens the time that gravity can pull your arrow down, so the point of impact changes from shooting the same horizontal distance. For example, if I am shooting at a goat that is 32 metres away from me, but downhill at an angle of 44 degrees, the ARC-equipped rangefinder will advise me to shoot the equivalent horizontal distance, which would be 23 metres. Even with the flattest shooting bows, that 9 metres may mean the difference between a marginal shot or a miss, and a clean, ethical kill. Its definitely something to take into consideration when shooting any up or down hill shots. 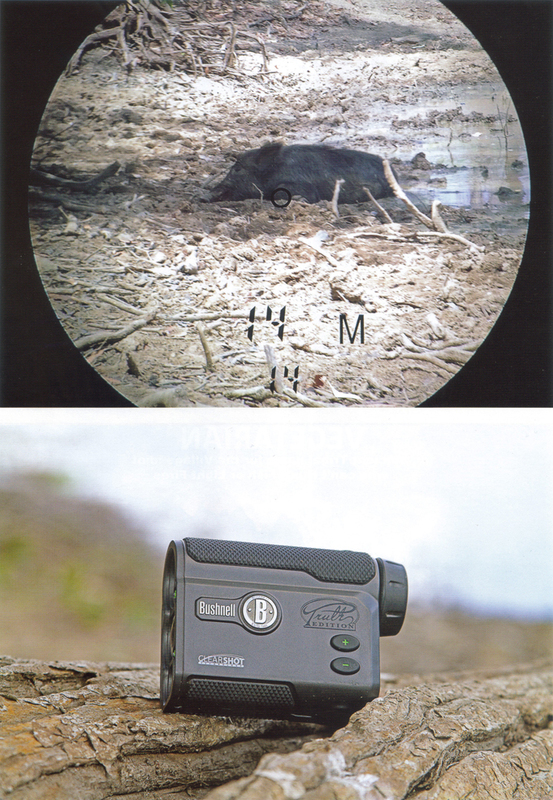 In summary, we loved Bushnell's The Truth with Clearshot Laser Rangefinder. Its compact size, light weight and ease of use make it invaluable in the field and an addition you can rely on to assist in cleanly and ethically taking shots with increased confidence. The Truth rangefinder has a 2-year warranty against defects in materials and workmanship.